... authors or book plot/characters ? You are a member of a NEWS TEAM dedicated to investigating a story that will be presented in a LIVE NEWS Broadcast! At the core of step one is BEING A RELIABLE JOURNALIST by researching in depth, checking facts & quality of resources along the way with your team. USE GOOGLE DOCS to collaborate and track your research. Include web addresses of sources and take notes of the content (in your own words). SHARE your Google Doc with your teacher and librarian so we can check your progress and offer suggestions too. Review your research and discuss how you will divide up the content and present your information. Time limits will require that you EDIT out the unnecessary parts and find a way to frame your information in a way that everyone listening with "get it". 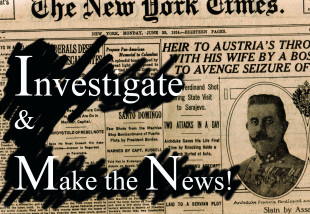 You will be presenting the news LIVE with background slides or other media.Use the sample templates for your news attached as "Investigative Assignment" (located in left column).